My performance experience is always collaborative. Light, movement, and interaction feed me. It is my way of being in the present moment in a heightened state of awareness. This process is exemplified most clearly in the work of TOHUBOHU! 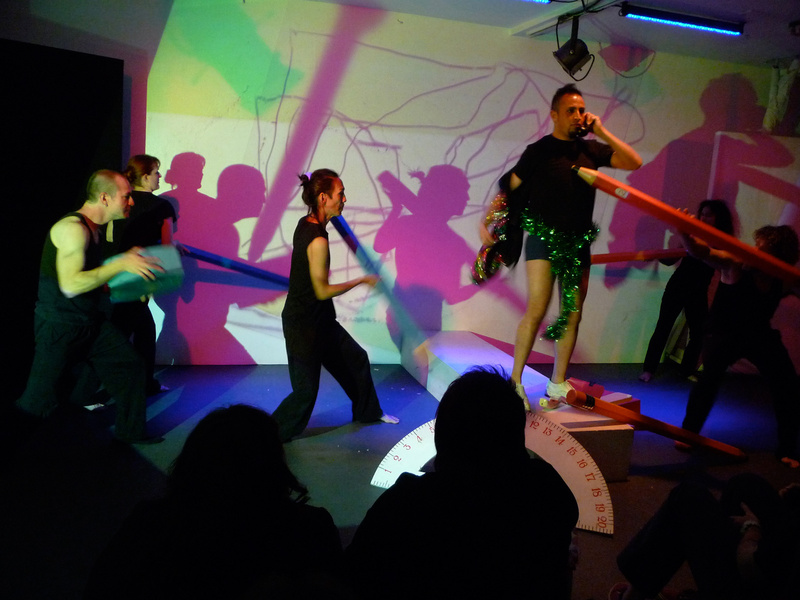 Rachel Rosenthal’s Extreme Theater Ensemble, actively employing improvisational performance processes developed by Rachel Rosenthal since the 1950’s. It was my honor to be invited by Rachel to provide live interactive visual effects with TOHUBOHU! in 2011. In live improvisational performance, I became astutely aware of the intuitive state of preparation and communication that Rachel identifies as the triangular relationship between the performers, the elements on stage (including lights, sets, costumes) and, the audience. Even after Rachel’s death in 2015, the process continues to electrify my studio work and provides fuel for new visual imagery that continues to this day. My first collaborative performance experience was with choreographer/dancer Deborah Cohen and composer/musician John Crigler. For two years, we developed and rehearsed Philosophical Toys: The Docent, initiated and directed by Cohen. In this case, the triangular relationship was between the dancer (as docent and guide), the visual artist (me creating live projected drawings on stage), and the musician (responding to the visual interaction). Cohen’s and my experience as educators at MOCA, leading visitors on interactive exhibition tours, was the inspiration and the impetus for the project. My lifetime of drawing from the live model provided the preparation for the visual collaboration and sparked my interest in generating imagery from movement. We performed the work in progress at Sushi in San Diego in 2003, further developed the piece for a performance in the MOCA Auditorium in early 2004 and finally, as part of the very first NOW (New Original Works) Festival at REDCAT in Disney Hall later in 2004. In 2008, the exhibition Circle in the Square at the Brand Library in Glendale was the first opportunity I had to include the audience directly in an opening performance with dancers Liz Curtis and Martha Carrascosa. The dancers initiated the interaction and invited the audience to participate in the application of colorful vinyl shapes to the stained glass window installation in the gallery. Later that year, the three month long Immersion project at 7 + Fig in downtown Los Angeles provided an opportunity to create a 52’ interactive stained glass window as well as the chance to develop three performances in relation to a site-specific wall painting with projections and live musicians Susan Rawcliffe on flutes and Brad Dutz on percussion. From 2008-2014, I studied Continuum Movement with founder, Emilie Conrad. From this meditative practice, I developed an awareness of my own inner and outer movement, through use of sound and breath. In turn, this process has shifted my awareness from responding to the movement of another to responding to my own internally generated fluid movement. 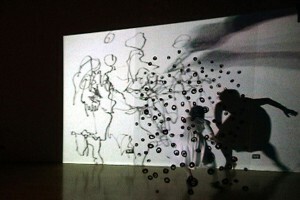 For Emilie, a series of nine-foot scroll drawings (the size of my reach), were generated in private performance in response to Emilie’s death in 2014. My Continuum practice continues to provide preparation and sustainance for my internal and external awareness as well as movement generated imagery.